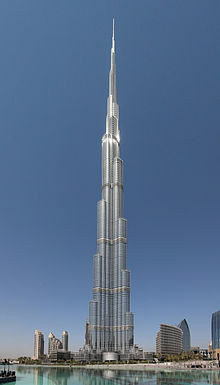 Completed in 2009, the Burj Khalifa, in Dubai (United Arab Emirates), is currently[update] the tallest skyscraper in the world, with a height of 829.8 metres (2,722 ft). The setbacks at various heights are a typical skyscraper feature. A skyscraper is a continuously habitable high-rise building that has over 40 floors and is taller than approximately 150 m (492 ft). Historically, the term first referred to buildings with 10 to 20 floors in the 1880s. The definition shifted with advancing construction technology during the 20th century. Skyscrapers may host commercial offices or residential space, or both. For buildings above a height of 300 m (984 ft), the term "supertall" can be used, while skyscrapers reaching beyond 600 m (1,969 ft) are classified as "megatall". Modern skyscrapers' walls are not load-bearing, and most skyscrapers are characterized by large surface areas of windows made possible by steel frames and curtain walls. However, skyscrapers can have curtain walls that mimic conventional walls with a small surface area of windows. Modern skyscrapers often have a tubular structure, and are designed to act like a hollow cylinder to resist wind, seismic, and other lateral loads. To appear more slender, allow less wind exposure, and transmit more daylight to the ground, many skyscrapers have a design with setbacks, which are sometimes also structurally required. 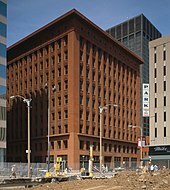 The term "skyscraper" was first applied to buildings of steel framed construction of at least 10 stories in the late 19th century, a result of public amazement at the tall buildings being built in major American cities like Chicago, New York City, Philadelphia, Detroit, and St. Louis. The first steel-frame skyscraper was the Home Insurance Building (originally 10 stories with a height of 42 m or 138 ft) in Chicago, Illinois in 1885. Some point to Philadelphia's 10-story Jayne Building (1849–50) as a proto-skyscraper, or to New York's seven-floor Equitable Life Building (New York City), built in 1870, for its innovative use of a kind of skeletal frame, but such designation depends largely on what factors are chosen. Even the scholars making the argument find it to be purely academic. The structural definition of the word skyscraper was refined later by architectural historians, based on engineering developments of the 1880s that had enabled construction of tall multi-story buildings. This definition was based on the steel skeleton—as opposed to constructions of load-bearing masonry, which passed their practical limit in 1891 with Chicago's Monadnock Building. What is the chief characteristic of the tall office building? It is lofty. It must be tall. The force and power of altitude must be in it, the glory and pride of exaltation must be in it. It must be every inch a proud and soaring thing, rising in sheer exaltation that from bottom to top it is a unit without a single dissenting line. The Council on Tall Buildings and Urban Habitat defines skyscrapers as those buildings which reach or exceed 150 m (490 ft) in height. Others in the United States and Europe also draw the lower limit of a skyscraper at 150 m (490 ft). The Emporis Standards Committee defines a high-rise building as "a multi-story structure between 35–100 meters tall, or a building of unknown height from 12–39 floors" and a skyscraper as "a multi-story building whose architectural height is at least 100 m or 330 ft." Some structural engineers define a highrise as any vertical construction for which wind is a more significant load factor than earthquake or weight. Note that this criterion fits not only high-rises but some other tall structures, such as towers. The tallest building in ancient times was the 146 m (479 ft) Great Pyramid of Giza in ancient Egypt, built in the 26th century BC. It was not surpassed in height for thousands of years, the 160 m (520 ft) Lincoln Cathedral having exceeded it in 1311–1549, before its central spire collapsed. The latter in turn was not surpassed until the 555-foot (169 m) Washington Monument in 1884. However, being uninhabited, none of these structures actually comply with the modern definition of a skyscraper. High-rise apartments flourished in classical antiquity. Ancient Roman insulae in imperial cities reached 10 and more stories. Beginning with Augustus (r. 30 BC-14 AD), several emperors attempted to establish limits of 20–25 m for multi-story buildings, but met with only limited success. Lower floors were typically occupied by shops or wealthy families, the upper rented to the lower classes. Surviving Oxyrhynchus Papyri indicate that seven-story buildings existed in provincial towns such as in 3rd century AD Hermopolis in Roman Egypt. The skylines of many important medieval cities had large numbers of high-rise urban towers, built by the wealthy for defense and status. The residential Towers of 12th century Bologna numbered between 80 and 100 at a time, the tallest of which is the 97.2 m (319 ft) high Asinelli Tower. A Florentine law of 1251 decreed that all urban buildings be immediately reduced to less than 26 m. Even medium-sized towns of the era are known to have proliferations of towers, such as the 72 up to 51 m height in San Gimignano. The medieval Egyptian city of Fustat housed many high-rise residential buildings, which Al-Muqaddasi in the 10th century described as resembling minarets. Nasir Khusraw in the early 11th century described some of them rising up to 14 stories, with roof gardens on the top floor complete with ox-drawn water wheels for irrigating them. Cairo in the 16th century had high-rise apartment buildings where the two lower floors were for commercial and storage purposes and the multiple stories above them were rented out to tenants. An early example of a city consisting entirely of high-rise housing is the 16th-century city of Shibam in Yemen. Shibam was made up of over 500 tower houses, each one rising 5 to 11 stories high, with each floor being an apartment occupied by a single family. The city was built in this way in order to protect it from Bedouin attacks. Shibam still has the tallest mudbrick buildings in the world, with many of them over 30 m (98 ft) high. An early modern example of high-rise housing was in 17th-century Edinburgh, Scotland, where a defensive city wall defined the boundaries of the city. Due to the restricted land area available for development, the houses increased in height instead. Buildings of 11 stories were common, and there are records of buildings as high as 14 stories. Many of the stone-built structures can still be seen today in the old town of Edinburgh. The oldest iron framed building in the world, although only partially iron framed, is The Flaxmill (also locally known as the "Maltings"), in Shrewsbury, England. Built in 1797, it is seen as the "grandfather of skyscrapers", since its fireproof combination of cast iron columns and cast iron beams developed into the modern steel frame that made modern skyscrapers possible. In 2013 funding was confirmed to convert the derelict building into offices. In 1857 Elisha Otis introduced the safety elevator, allowing convenient and safe passenger movement to upper floors. Another crucial development was the use of a steel frame instead of stone or brick, otherwise the walls on the lower floors on a tall building would be too thick to be practical. An early development in this area was Oriel Chambers in Liverpool, England. It was only five floors high. Further developments led to the world's first skyscraper, the ten-story Home Insurance Building in Chicago, built in 1884–1885. While its height is not considered very impressive today, it was at that time. The building of tall buildings in the 1880s gave the skyscraper its first architectural movement the Chicago School, which developed what has been called the Commercial Style. The architect, Major William Le Baron Jenney, created a load-bearing structural frame. In this building, a steel frame supported the entire weight of the walls, instead of load-bearing walls carrying the weight of the building. This development led to the "Chicago skeleton" form of construction. In addition to the steel frame, the Home Insurance Building also utilized fireproofing, elevators, and electrical wiring, key elements in most skyscrapers today. Burnham and Root's 45 m (148 ft) Rand McNally Building in Chicago, 1889, was the first all-steel framed skyscraper, while Louis Sullivan's 41 m (135 ft) Wainwright Building in St. Louis, Missouri, 1891, was the first steel-framed building with soaring vertical bands to emphasize the height of the building and is therefore considered to be the first early skyscraper. In 1889, the Mole Antonelliana in Italy was 167 m (549 ft) tall. Most early skyscrapers emerged in the land-strapped areas of Chicago and New York City toward the end of the 19th century. A land boom in Melbourne, Australia between 1888 and 1891 spurred the creation of a significant number of early skyscrapers, though none of these were steel reinforced and few remain today. Height limits and fire restrictions were later introduced. London builders soon found building heights limited due to a complaint from Queen Victoria, rules that continued to exist with few exceptions. Concerns about aesthetics and fire safety had likewise hampered the development of skyscrapers across continental Europe for the first half of the twentieth century. Some notable exceptions are the 43 m (141 ft) tall 1898 Witte Huis (White House) in Rotterdam; the Royal Liver Building in Liverpool, completed in 1911 and 90 m (300 ft) high; the 57 m (187 ft) tall 1924 Marx House in Düsseldorf, Germany; the 61 m (200 ft) Kungstornen (Kings' Towers) in Stockholm, Sweden, which were built 1924–25, the 89 m (292 ft) Edificio Telefónica in Madrid, Spain, built in 1929; the 87.5 m (287 ft) Boerentoren in Antwerp, Belgium, built in 1932; the 66 m (217 ft) Prudential Building in Warsaw, Poland, built in 1934; and the 108 m (354 ft) Torre Piacentini in Genoa, Italy, built in 1940. After an early competition between Chicago and New York City for the world's tallest building, New York took the lead by 1895 with the completion of the 103 m (338 ft) tall American Surety Building, leaving New York with the title of the world's tallest building for many years. 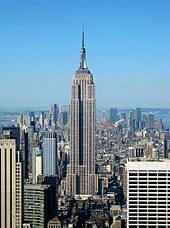 Completed in 1931, the Empire State Building in New York City was the tallest building in the world for nearly 40 years. Modern skyscrapers are built with steel or reinforced concrete frameworks and curtain walls of glass or polished stone. They use mechanical equipment such as water pumps and elevators. From the 1930s onward, skyscrapers began to appear around the world—such as in Latin America (such as São Paulo, Rio de Janeiro, Buenos Aires, Santiago, Lima, Caracas, Bogotá, Panama City, Mexico City, Monterrey) and in Asia (Tokyo, Shanghai, Hong Kong, Manila, Jakarta, Singapore, Mumbai, Seoul, Kuala Lumpur, Taipei, Bangkok). Immediately after World War II, the Soviet Union planned eight massive skyscrapers, seven of which were built by 1953, dubbed the "Seven Sisters of Moscow". The Building of Moscow State University was the tallest building in Europe in 1953–1990. Other skyscrapers in the style of Socialist Classicism were erected in East Germany (Frankfurter Tor), Poland (PKiN), Ukraine (Hotel Ukrayina), Latvia (Academy of Sciences) and other countries. The western countries of Europe also began to permit taller skyscrapers than before WW2, such as Madrid during the 1950s (Gran Vía). Finally, skyscrapers also began to be constructed in cities of Africa, the Middle East and Oceania (mainly Australia) from the late 1950s on. Skyscraper projects after World War II typically rejected the classical designs of the early skyscrapers, instead embracing the uniform international style; many older skyscrapers were redesigned to suit contemporary tastes or even demolished—such as New York's Singer Building, once the world's tallest skyscraper. German architect Ludwig Mies van der Rohe became one of the world's most renowned architects in the second half of the 20th century. He conceived of the glass façade skyscraper and, along with Norwegian Fred Severud, he designed the Seagram Building in 1958, a skyscraper that is often regarded as the pinnacle of the modernist high-rise architecture. After the Great Depression skyscrapers construction suffered a hiatus for over thirty years due to economic problems. A revival occurred with structural innovations that transformed the industry, making it possible for people to live and work in "cities in the sky". In the early 1960s structural engineer Fazlur Rahman Khan, considered the "father of tubular designs" for high-rises, discovered that the dominating rigid steel frame structure was not the only system apt for tall buildings, marking a new era of skyscraper construction in terms of multiple structural systems. His central innovation in skyscraper design and construction was the concept of the "tube" structural system, including the "framed tube", "trussed tube", and "bundled tube". His "tube concept", using all the exterior wall perimeter structure of a building to simulate a thin-walled tube, revolutionized tall building design. These systems allow greater economic efficiency, and also allow skyscrapers to take on various shapes, no longer needing to be rectangular and box-shaped. The first building to employ the tube structure was the Chestnut De-Witt apartment building, this building is considered to be a major development in modern architecture. These new designs opened an economic door for contractors, engineers, architects, and investors, providing vast amounts of real estate space on minimal plots of land. Over the next fifteen years, many towers were built by Fazlur Rahman Khan and the "Second Chicago School", including the hundred story John Hancock Center and the massive 442 m (1,450 ft) Willis Tower. Other pioneers of this field include Hal Iyengar and William LeMessurier. Many buildings designed in the 70s lacked a particular style and recalled ornamentation from earlier buildings designed before the 50s. These design plans ignored the environment and loaded structures with decorative elements and extravagant finishes. This approach to design was opposed by Fazlur Khan and he considered the designs to be whimsical rather than rational. Moreover, he considered the work to be a waste of precious natural resources. Khan's work promoted structures integrated with architecture and the least use of material resulting in the least carbon emission impact on the environment. The next era of skyscrapers will focus on the environment including performance of structures, types of material, construction practices, absolute minimal use of materials/natural resources, emboided energy within the structures, and more importantly, a holistically integrated building systems approach. Modern building practices regarding supertall structures have led to the study of "vanity height". Vanity height, according to the CTBUH, is the distance between the highest floor and its architectural top (excluding antennae, flagpole or other functional extensions). Vanity height first appeared in New York City skyscrapers as early as the 1920s and 1930s but supertall buildings have relied on such uninhabitable extensions for on average 30% of their height, raising potential definitional and sustainability issues. The current era of skyscrapers focuses on sustainability, its built and natural environments, including the performance of structures, types of materials, construction practices, absolute minimal use of materials and natural resources, energy within the structure, and a holistically integrated building systems approach. LEED is a current green building standard. Architecturally, with the movements of Postmodernism, New Urbanism and New Classical Architecture, that established since the 1980s, a more classical approach came back to global skyscraper design, that remains popular today. Examples are the Wells Fargo Center, NBC Tower, Parkview Square, 30 Park Place, the Messeturm, the iconic Petronas Towers and Jin Mao Tower. Other contemporary styles and movements in skyscraper design include organic, sustainable, neo-futurist, structuralist, high-tech, deconstructivist, blob, digital, streamline, novelty, critical regionalist, vernacular, Neo Art Deco and neo-historist, also known as revivalist. 3 September is the global commemorative day for skyscrapers, called "Skyscraper Day". New York City developers competed among themselves, with successively taller buildings claiming the title of "world's tallest" in the 1920s and early 1930s, culminating with the completion of the 318.9 m (1,046 ft) Chrysler Building in 1930 and the 443.2 m (1,454 ft) Empire State Building in 1931, the world's tallest building for forty years. The first completed 417 m (1,368 ft) tall World Trade Center tower became the world's tallest building in 1972. However, it was overtaken by the Sears Tower (now Willis Tower) in Chicago within two years. The 442 m (1,450 ft) tall Sears Tower stood as the world's tallest building for 24 years, from 1974 until 1998, until it was edged out by 452 m (1,483 ft) Petronas Twin Towers in Kuala Lumpur, which held the title for six years. The design and construction of skyscrapers involves creating safe, habitable spaces in very tall buildings. The buildings must support their weight, resist wind and earthquakes, and protect occupants from fire. Yet they must also be conveniently accessible, even on the upper floors, and provide utilities and a comfortable climate for the occupants. The problems posed in skyscraper design are considered among the most complex encountered given the balances required between economics, engineering, and construction management. One common feature of skyscrapers is a steel framework from which curtain walls are suspended, rather than load-bearing walls of conventional construction. Most skyscrapers have a steel frame that enables them to be built taller than typical load-bearing walls of reinforced concrete. Skyscrapers usually have a particularly small surface area of what are conventionally thought of as walls. Because the walls are not load-bearing most skyscrapers are characterized by surface areas of windows made possible by the concept of steel frame and curtain wall. However, skyscrapers can also have curtain walls that mimick conventional walls and have a small surface area of windows. The concept of a skyscraper is a product of the industrialized age, made possible by cheap fossil fuel derived energy and industrially refined raw materials such as steel and concrete. The construction of skyscrapers was enabled by steel frame construction that surpassed brick and mortar construction starting at the end of the 19th century and finally surpassing it in the 20th century together with reinforced concrete construction as the price of steel decreased and labour costs increased. The steel frames become inefficient and uneconomic for supertall buildings as usable floor space is reduced for progressively larger supporting columns. Since about 1960, tubular designs have been used for high rises. This reduces the usage of material (more efficient in economic terms – Willis Tower uses a third less steel than the Empire State Building) yet allows greater height. It allows fewer interior columns, and so creates more usable floor space. It further enables buildings to take on various shapes. Elevators are characteristic to skyscrapers. In 1852 Elisha Otis introduced the safety elevator, allowing convenient and safe passenger movement to upper floors. Another crucial development was the use of a steel frame instead of stone or brick, otherwise the walls on the lower floors on a tall building would be too thick to be practical. Today major manufacturers of elevators include Otis, ThyssenKrupp, Schindler, and KONE. Advances in construction techniques have allowed skyscrapers to narrow in width, while increasing in height. Some of these new techniques include mass dampers to reduce vibrations and swaying, and gaps to allow air to pass through, reducing wind shear. Good structural design is important in most building design, but particularly for skyscrapers since even a small chance of catastrophic failure is unacceptable given the high price. This presents a paradox to civil engineers: the only way to assure a lack of failure is to test for all modes of failure, in both the laboratory and the real world. But the only way to know of all modes of failure is to learn from previous failures. Thus, no engineer can be absolutely sure that a given structure will resist all loadings that could cause failure, but can only have large enough margins of safety such that a failure is acceptably unlikely. When buildings do fail, engineers question whether the failure was due to some lack of foresight or due to some unknowable factor. The load a skyscraper experiences is largely from the force of the building material itself. In most building designs, the weight of the structure is much larger than the weight of the material that it will support beyond its own weight. In technical terms, the dead load, the load of the structure, is larger than the live load, the weight of things in the structure (people, furniture, vehicles, etc.). As such, the amount of structural material required within the lower levels of a skyscraper will be much larger than the material required within higher levels. This is not always visually apparent. The Empire State Building's setbacks are actually a result of the building code at the time (1916 Zoning Resolution), and were not structurally required. On the other hand, John Hancock Center's shape is uniquely the result of how it supports loads. Vertical supports can come in several types, among which the most common for skyscrapers can be categorized as steel frames, concrete cores, tube within tube design, and shear walls. The wind loading on a skyscraper is also considerable. In fact, the lateral wind load imposed on supertall structures is generally the governing factor in the structural design. Wind pressure increases with height, so for very tall buildings, the loads associated with wind are larger than dead or live loads. Other vertical and horizontal loading factors come from varied, unpredictable sources, such as earthquakes. By 1895, steel had replaced cast iron as skyscrapers' structural material. Its malleability allowed it to be formed into a variety of shapes, and it could be riveted, ensuring strong connections. The simplicity of a steel frame eliminated the inefficient part of a shear wall, the central portion, and consolidated support members in a much stronger fashion by allowing both horizontal and vertical supports throughout. Among steel's drawbacks is that as more material must be supported as height increases, the distance between supporting members must decrease, which in turn increases the amount of material that must be supported. This becomes inefficient and uneconomic for buildings above 40 stories tall as usable floor spaces are reduced for supporting column and due to more usage of steel. A new structural system of framed tubes was developed in 1963. Fazlur Khan and J. Rankine defined the framed tube structure as "a three dimensional space structure composed of three, four, or possibly more frames, braced frames, or shear walls, joined at or near their edges to form a vertical tube-like structural system capable of resisting lateral forces in any direction by cantilevering from the foundation." Closely spaced interconnected exterior columns form the tube. Horizontal loads (primarily wind) are supported by the structure as a whole. Framed tubes allow fewer interior columns, and so create more usable floor space, and about half the exterior surface is available for windows. Where larger openings like garage doors are required, the tube frame must be interrupted, with transfer girders used to maintain structural integrity. Tube structures cut down costs, at the same time allowing buildings to reach greater heights. Concrete tube-frame construction was first used in the DeWitt-Chestnut Apartment Building, completed in Chicago in 1963, and soon after in the John Hancock Center and World Trade Center. The tubular systems are fundamental to tall building design. Most buildings over 40-stories constructed since the 1960s now use a tube design derived from Khan's structural engineering principles, examples including the construction of the World Trade Center, Aon Center, Petronas Towers, Jin Mao Building, and most other supertall skyscrapers since the 1960s. The strong influence of tube structure design is also evident in the construction of the current tallest skyscraper, the Burj Khalifa. Changes of structure with height; the tubular systems are fundamental for supertall buildings. Khan pioneered several other variations of the tube structure design. One of these was the concept of X-bracing, or the "trussed tube", first employed for the John Hancock Center. This concept reduced the lateral load on the building by transferring the load into the exterior columns. This allows for a reduced need for interior columns thus creating more floor space. This concept can be seen in the John Hancock Center, designed in 1965 and completed in 1969. One of the most famous buildings of the structural expressionist style, the skyscraper's distinctive X-bracing exterior is actually a hint that the structure's skin is indeed part of its 'tubular system'. This idea is one of the architectural techniques the building used to climb to record heights (the tubular system is essentially the spine that helps the building stand upright during wind and earthquake loads). This X-bracing allows for both higher performance from tall structures and the ability to open up the inside floorplan (and usable floor space) if the architect desires. The John Hancock Center was far more efficient than earlier steel-frame structures. Where the Empire State Building (1931), required about 206 kilograms of steel per square metre and Chase Manhattan Bank Building (1961) required 275, the John Hancock Center required only 145. The trussed tube concept was applied to many later skyscrapers, including the Onterie Center, Citigroup Center and Bank of China Tower. An important variation on the tube frame is the "bundled tube", which uses several interconnected tube frames. The Willis Tower in Chicago used this design, employing nine tubes of varying height to achieve its distinct appearance. The bundled tube structure meant that "buildings no longer need be boxlike in appearance: they could become sculpture." The invention of the elevator was a precondition for the invention of skyscrapers, given that most people would not (or could not) climb more than a few flights of stairs at a time. The elevators in a skyscraper are not simply a necessary utility, like running water and electricity, but are in fact closely related to the design of the whole structure: a taller building requires more elevators to service the additional floors, but the elevator shafts consume valuable floor space. If the service core, which contains the elevator shafts, becomes too big, it can reduce the profitability of the building. Architects must therefore balance the value gained by adding height against the value lost to the expanding service core. Many tall buildings use elevators in a non-standard configuration to reduce their footprint. Buildings such as the former World Trade Center Towers and Chicago's John Hancock Center use sky lobbies, where express elevators take passengers to upper floors which serve as the base for local elevators. This allows architects and engineers to place elevator shafts on top of each other, saving space. Sky lobbies and express elevators take up a significant amount of space, however, and add to the amount of time spent commuting between floors. Other buildings, such as the Petronas Towers, use double-deck elevators, allowing more people to fit in a single elevator, and reaching two floors at every stop. It is possible to use even more than two levels on an elevator, although this has never been done. The main problem with double-deck elevators is that they cause everyone in the elevator to stop when only people on one level need to get off at a given floor. Buildings with sky lobbies include the World Trade Center, Petronas Twin Towers, Willis Tower and Taipei 101. The 44th-floor sky lobby of the John Hancock Center also featured the first high-rise indoor swimming pool, which remains the highest in America. Skyscrapers are usually situated in city centers where the price of land is high. Constructing a skyscraper becomes justified if the price of land is so high that it makes economic sense to build upward as to minimize the cost of the land per the total floor area of a building. Thus the construction of skyscrapers is dictated by economics and results in skyscrapers in a certain part of a large city unless a building code restricts the height of buildings. Skyscrapers are rarely seen in small cities and they are characteristic of large cities, because of the critical importance of high land prices for the construction of skyscrapers. Usually only office, commercial and hotel users can afford the rents in the city center and thus most tenants of skyscrapers are of these classes. Some skyscrapers have been built in areas where the bedrock is near surface, because this makes constructing the foundation cheaper, for example this is the case in Midtown Manhattan and Lower Manhattan, in New York City, but not in-between these two parts of the city. Today, skyscrapers are an increasingly common sight where land is expensive, as in the centers of big cities, because they provide such a high ratio of rentable floor space per unit area of land. One problem with skyscrapers is car parking. In the largest cities most people commute via public transport, but for smaller cities a lot of parking spaces are needed. Multi-storey car parks are impractical to build very tall, so a lot of land area is needed. There may be a correlation between skyscraper construction and great income inequality but this has not been conclusively proven. The amount of steel, concrete, and glass needed to construct a single skyscraper is large, and these materials represent a great deal of embodied energy. Skyscrapers are thus energy intensive buildings, but skyscrapers have a long lifespan, for example the Empire State Building in New York City, United States completed in 1931 and is still in active use. Skyscrapers have considerable mass, which means that they must be built on a sturdier foundation than would be required for shorter, lighter buildings. Building materials must also be lifted to the top of a skyscraper during construction, requiring more energy than would be necessary at lower heights. Furthermore, a skyscraper consumes a lot of electricity because potable and non-potable water has to be pumped to the highest occupied floors, skyscrapers are usually designed to be mechanically ventilated, elevators are generally used instead of stairs, and natural lighting cannot be utilized in rooms far from the windows and the windowless spaces such as elevators, bathrooms and stairwells. Skyscrapers can be artificially lit and the energy requirements can be covered by renewable energy or other electricity generation with low greenhouse gas emissions. Heating and cooling of skyscrapers can be efficient, because of centralized HVAC systems, heat radiation blocking windows and small surface area of the building. There is Leadership in Energy and Environmental Design (LEED) certification for skyscrapers. For example, the Empire State Building received a gold Leadership in Energy and Environmental Design rating in September 2011 and the Empire State Building is the tallest LEED certified building in the United States, proving that skyscrapers can be environmentally friendly. Also the 30 St Mary Axe in London, the United Kingdom is an environmentally friendly skyscraper. The elevator conundrum creates the need for more lift shafts—everyone comes in at the bottom and they all have to pass through the lower part of the building to get to the upper levels. Building services – power and water enter the building from below and have to pass through the lower levels to get to the upper levels. In low-rise structures, the support rooms (chillers, transformers, boilers, pumps and air handling units) can be put in basements or roof space—areas which have low rental value. There is, however, a limit to how far this plant can be located from the area it serves. The farther away it is the larger the risers for ducts and pipes from this plant to the floors they serve and the more floor area these risers take. In practice this means that in highrise buildings this plant is located on 'plant levels' at intervals up the building. The Home Insurance Building in Chicago, which was built in 1884, is considered the world's first skyscraper due to its steel skeleton). Subsequent buildings such as the Singer Building and the Metropolitan Life Tower were higher still. The Flatiron Building, designed by Daniel Hudson Burnham and standing 285 ft (87 m) high, was one of the tallest buildings in New York City upon its completion in 1902, made possible by its steel skeleton. It was one of the first buildings designed with a steel framework, and to achieve this height with other construction methods of that time would have been very difficult. (The Tower Building, designed by Bradford Gilbert and built in 1889, is considered by some to be New York City's first skyscraper, and may have been the first building in New York City to use a skeletal steel frame,. Later in 1930 the Chrysler Building took the lead as the tallest building in the world, scraping the sky at 1,046 feet (319 m). Designed by William Van Alen, an Art Deco style masterpiece with an exterior crafted of brick, the Chrysler Building continues to be a favorite of New Yorkers to this day. The Willis Tower (formerly Sears Tower) was completed in 1974, one year after the World Trade Center, and surpassed it as the world's tallest building. It was the first building to employ the "bundled tube" structural system, designed by Fazlur Khan. The building was not surpassed in height until the Petronas Towers were constructed in 1998, but remained the tallest in some categories until Burj Khalifa surpassed it in all categories in 2010. It is currently the second tallest building in the United States, after One World Trade Center, which was built to replace the destroyed towers. Momentum in setting records passed from the United States to other nations with the opening of the Petronas Twin Towers in Kuala Lumpur, Malaysia, in 1998. The record for the world's tallest building has remained in Asia since the opening of Taipei 101 in Taipei, Taiwan, in 2004. A number of architectural records, including those of the world's tallest building and tallest free-standing structure, moved to the Middle East with the opening of the Burj Khalifa in Dubai, United Arab Emirates. The following list measures height of the roof. [not in citation given] The more common gauge is the "highest architectural detail"; such ranking would have included Petronas Towers, built in 1996. 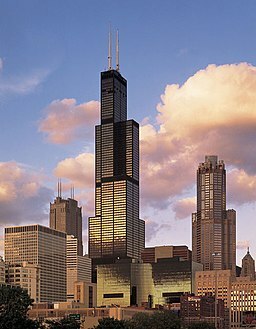 The Willis Tower in Chicago was the world's tallest building from 1974 to 1998; many still refer to it as the "Sears Tower," its name from inception to 2009. The Petronas Twin Towers in Kuala Lumpur were the tallest from 1998 to 2004. Taipei 101, the world's tallest skyscraper from 2004 to 2010, was the first to exceed the 500-metre mark. Many skyscrapers were never built due to financial problems, politics and culture. The Chicago Spire was to be the tallest building in the Western Hemisphere, but it was on hold due to the global financial crisis of 2008. One year later, the project was cancelled. The 610-metre (2,000 ft) Russia Tower was cancelled due to the global financial crisis of 2008. It would have dominated the Moscow skyline. Construction began in 1937 on the Palace of the Soviets in Moscow. It would have been the tallest building in the world at the time, but because of the German invasion in 1941 the unfinished steel frame was torn down for scrap to use in the war effort. Proposed in 1989, The Miglin-Beitler Skyneedle of Chicago would have been the tallest freestanding in the world. But it was never built due to the Persian gulf war. The cancelled Chicago World Trade Center would have been the first skyscraper to exceed a height of 700 metres (2,300 ft). It was proposed in the 1990s, a second one was to be completed but never built. The construction of the 200-floor, Dubai's Nakheel Tower—which was planned to be taller than 1,000 metres (3,300 ft)—was halted due to financial problems; 18 months later the project was cancelled. Harry Grant's Grant USA Tower in Newark, New Jersey was never built due to bankruptcy, the tower would have more than 550 meters tall. The proposed 1 New York Place would have had a height of 320 metres (1,050 ft), but was never built. Vision Brisbane was to be the tallest building in Brisbane and third tallest in Australia if built. It was cancelled due to the 2008 global financial crisis and the site was eventually sold where construction of a skyscraper of similar height was approved. The original design of Hong Kong's International Commerce Centre, with a height of 574 metres (1,883 ft), was supposed to have a crystal façade. It was changed and decreased to 484 metres (1,588 ft) due to height restrictions. Proposals for such structures have been put forward, including the Burj Mubarak Al Kabir in Kuwait and Azerbaijan Tower in Baku. Kilometer-plus structures present architectural challenges that may eventually place them in a new architectural category. The first building under construction and planned to be over one kilometre tall is the Jeddah Tower. Several wooden skyscraper designs have been designed and built. A 14-story housing project in Bergen, Norway known as 'Treet' or 'The Tree' became the world's tallest wooden apartment block when it was completed in late 2015. The Tree's record was eclipsed by Brock Commons, an 18-story wooden dormitory at the University of British Columbia in Canada, when it was completed in September 2016. A 40-story residential building 'Trätoppen' has been proposed by architect Anders Berensson to be built in Stockholm, Sweden. Trätoppen would be the tallest building in Stockholm, though there are no immediate plans to begin construction. The tallest currently-planned wooden skyscraper is the 70-story W350 Project in Tokyo, to be built by the Japanese wood products company Sumitomo Forestry Co. to celebrate its 350th anniversary in 2041. An 80-story wooden skyscraper, the River Beech Tower, has been proposed by a team including architects Perkins + Will and the University of Cambridge. The River Beech Tower, on the banks of the Chicago River in Chicago, Illinois, would be 348 feet shorter than the W350 Project despite having 10 more stories. Wooden skyscrapers are estimated to be around a quarter of the weight of an equivalent reinforced-concrete structure as well as reducing the building carbon footprint by 60–75%. Buildings have been designed using cross-laminated timber (CLT) which gives a higher rigidity and strength to wooden structures. CLT panels are prefabricated and can therefore speed up building time. ^ a b The Editors of Encyclopædia Britannica. "Skyscraper". Encyclopædia Britannica. Encyclopædia Britannica. Retrieved 25 October 2016. ^ a b Ambrose, Gavin; Harris, Paul; Stone, Sally (2008). The Visual Dictionary of Architecture. Switzerland: AVA Publishing SA. p. 233. ISBN 978-2-940373-54-3. ^ Charles E. Peterson (October 1950). "Ante-Bellum Skyscraper". Journal of the Society of Architectural Historians. 9:3: 25–28. ^ Ivars Peterson (5 April 1986). "The first skyscraper – new theory that Home Insurance Building was not the first". CBS Interactive. Archived from the original on 8 July 2012. Retrieved 6 January 2010. "In my view, we can no longer argue that the Home Insurance Building was the first skyscraper," says Carl W. Condit, now retired from Northwestern University in Evanston, Ill., and author of several books on Chicago architecture. "The claim rests on an unacceptably narrow idea of what constitutes a high-rise commercial building," he says. "If there is a building in which all these technical factors—structural system, elevator, utilities—converge at the requisite level of maturity," argues Condit, "it's the Equitable Life Assurance Building in New York." Completed in 1870, the building rose 7½ stories, twice the height of its neighbors. ^ "Which World City Has The Most Skyscrapers?". The Urban Developer. 11 March 2016. Retrieved 26 March 2018. ^ "Penza State University of Architecture and Construction; Before The Workshop (1) Tower". Fondazione-delbianco.org. 31 August 1939. Retrieved 5 June 2011. ^ A.F.K. "The Project Gutenberg eBook of The Cathedral Church of Lincoln, by A.F. Kendric, B.A". Gwydir.demon.co.uk. Retrieved 5 June 2011. ^ Behrens-Abouseif, Doris (1992). Islamic Architecture in Cairo. Brill Publishers. p. 6. ISBN 978-90-04-09626-4. ^ a b UNESCO World Heritage Centre. "Old Walled City of Shibam". ^ Shipman, J. G. T. (June 1984). "The Hadhramaut". Asian Affairs. 15 (2): 154–62. doi:10.1080/03068378408730145. ^ "Shrewsbury Flax Mill: Funding for offices and restoration". BBC News. 30 July 2013. Retrieved 30 July 2013. ^ Smith, Chrysti M. (2006). Verbivore's Feast: Second Course: More Word & Phrase Origins. Farcountry Press. p. 289. ISBN 978-1-56037-402-2. The word skyscraper, in its architectural context, was first applied to the Home Insurance Building, completed in Chicago in 1885. ^ Marshall, Colin (2 April 2015). "The world's first skyscraper: a history of cities in 50 buildings, day 9". the Guardian. ^ Dupré, Judith. Skyscrapers. New York: Black Dog & Leventhal, 1996. Print. ^ "The Plan Comes Together". Encyclopedia of Chicago. Retrieved 27 July 2013. ^ "Royal Liver Building". Encyclopædia Britannica. Retrieved 23 June 2011. ^ Hultin, Olof; Bengt O H Johansson; Johan Mårtelius; Rasmus Wærn (1998). The Complete Guide to Architecture in Stockholm. Stockholm: Arkitektur Förlag. p. 62. ISBN 978-91-86050-43-6. ^ A Dictionary of Architecture and Landscape Architecture. Oxford University Press. 2006. p. 880. ISBN 978-0-19-860678-9. ^ Nordenson, Guy (2008). Seven Structural Engineers: The Felix Candela Lectures. New York City: Museum of Modern Art. p. 21. ISBN 978-0870707032. ^ "Mies van der Rohe Dies at 83; Leader of Modern Architecture". The New York Times. 17 August 1969. Retrieved 21 July 2007. Mies van der Rohe, one of the great figures of 20th-century architecture. ^ a b c Lynn Beadle (2001). Tall Buildings and Urban Habitat. CRC Press. p. 482. ISBN 978-0-203-46754-1. ^ a b "Designing cities in the sky". lehigh.edu. 14 March 2007. ^ Weingardt, Richard (2005). Engineering Legends. ASCE Publications. p. 75. ISBN 978-0-7844-0801-8. ^ Mir M. Ali, Kyoung Sun Moon. "Structural developments in tall buildings: current trends and future prospects". Architectural Science Review (September 2007). Retrieved 10 December 2008. ^ a b c Ali, Mir M. (2001). "Evolution of Concrete Skyscrapers: from Ingalls to Jin mao". Electronic Journal of Structural Engineering. 1 (1): 2–14. Retrieved 30 November 2008. ^ Weingardt, Richard (2005). Engineering Legends. ASCE Publications. p. 76. ISBN 978-0-7844-0801-8. ^ a b Alfred Swenson & Pao-Chi Chang (2008). "Building construction: High-rise construction since 1945". Encyclopædia Britannica. Retrieved 9 December 2008. ^ a b c Stephen Bayley (5 January 2010). "Burj Dubai: The new pinnacle of vanity". The Daily Telegraph. Retrieved 26 February 2010. ^ Billington, David P. (1985). The Tower and the Bridge: The New Art of Structural Engineering. Princeton University Press. pp. 234–5. ISBN 978-0-691-02393-9. ^ "List of Tallest skyscrapers in Chicago". Emporis.com. 15 June 2009. Retrieved 5 June 2011. ^ a b Strauss, Alfred; Frangopol, Dan; Bergmeister, Konrad (2012-09-18). Life-Cycle and Sustainability of Civil Infrastructure Systems: Proceedings of the Third International Symposium on Life-Cycle Civil Engineering (IALCCE'12), Vienna, Austria, October 3-6, 2012. ISBN 9780203103364. ^ Strauss, Alfred; Frangopol, Dan; Bergmeister, Konrad (2012-09-18). Life-Cycle and Sustainability of Civil Infrastructure Systems: Proceedings of the Third International Symposium on Life-Cycle Civil Engineering (IALCCE'12), Vienna, Austria, October 3-6, 2012. ISBN 9780203103364. ^ "Tall Buildings In Numbers Vanity Height". Ctbuh.org. Retrieved 21 September 2013. ^ "CTBUH releases list of supertall towers with highest percentages of 'vanity height'". World Architecture News. Retrieved 21 September 2013. ^ "Most of the World's Tallest Buildings Game the System With 'Vanity Height' – Jenny Xie". The Atlantic Cities. 9 September 2013. Retrieved 21 September 2013. ^ Lecher, Colin. "The World's Tallest Skyscrapers Have A Dirty Little Secret". Popsci.com. Retrieved 21 September 2013. ^ "World's tallest skyscapers? [sic] Only if 'useless' needles count". NY Daily News. 7 September 2013. Retrieved 21 September 2013. ^ Alfred Strauss; Dan Frangopol; Konrad Bergmeister (2012). Life-Cycle and Sustainability of Civil Infrastructure Systems: Proceedings of the Third International Symposium on Life-Cycle Civil Engineering (IALCCE'12), Vienna, Austria, October 3-6, 2012. CRC Press. ISBN 978-0-203-10336-4. ^ Adam, Robert. "How to Build Skyscrapers". City Journal. Retrieved 20 September 2014. ^ Whitman, Elizabeth. "Skyscraper Day 2015: 10 Facts, Photos Celebrating Ridiculously Tall Buildings Around The World". International Business Times. Retrieved 3 September 2015. ^ a b c "Lehigh University: Fazlur Rahman Khan Distinguished Lecture Series". Lehigh.edu. Retrieved 14 June 2013. ^ "Why Can't We Build Skinny Skyscrapers Everywhere?". CityLab. Retrieved 2015-12-31. ^ Leslie, Thomas (June 2010). "Built Like Bridges: Iron, Steel, and Rivets in the Nineteenth-century Skyscraper". Journal of the Society of Architectural Historians. 69 (2): 234–261. doi:10.1525/jsah.2010.69.2.234. JSTOR 10.1525/jsah.2010.69.2.234. Abstract only. ^ "Evolution of Concrete Skyscrapers". Archived from the original on 5 June 2007. Retrieved 14 May 2007. ^ Alfred Swenson & Pao-Chi Chang (2008). "building construction". Encyclopædia Britannica. Retrieved 9 December 2008. ^ "Top 10 world's tallest steel buildings". Constructionweekonline.com. Retrieved 14 June 2013. ^ Dr. D. M Chan. "Introduction to Tall building Structures" (PDF). Teaching.ust.hk. p. 34. Archived from the original (PDF) on 17 December 2010. ^ "How Skyscrapers Work: Making it Functional". HowStuffWorks. Retrieved 30 October 2008. ^ Emporis GmbH. "John Hancock Center". ^ "Does Inequality Promote Skyscrapers?". ^ Dailey, Jessica (14 September 2011). "Empire State Building Achieves LEED Gold Certification". Inhabitat.com. Retrieved 30 July 2013. ^ "Home Insurance Building". HISTORY.com. ^ Edward Robb Ellis (2005). The Epic of New York City. Carroll & Graf publishers. pp. 405–415. ISBN 978-0-7867-1436-0. ^ "Chrysler Building. Quote: An exhibition in the building's lobby reports the height as 1046". Skyscraperpage.com. Retrieved 5 June 2011. ^ Emporis GmbH. "– Chrysler Building statistics". Emporis.com. Retrieved 5 June 2011. ^ "America's Favorite Architecture: Chrysler Building ranked 9th". Favoritearchitecture.org. Archived from the original on 10 May 2011. Retrieved 5 June 2011. ^ Pollak, Michael (23 April 2006). "75 YEARS: F. Y. I." The New York Times. Retrieved 31 October 2009. ^ "The World's Tallest Buildings | Statistics". Emporis. Retrieved 12 March 2014. ^ "Grant USA Tower, Newark - SkyscraperPage.com". ^ Owainati, Sadek (3 November 2008). "Reaching for the stars". ArabianBusiness.com. Retrieved 15 November 2008. ^ Editorial, Reuters. "Wooden 'plyscrapers' challenge concrete and steel". U.S. Retrieved 2018-03-22. ^ "The University of British Columbia's Brock Commons Takes the Title of Tallest Wood Tower". Architect. 2016-09-16. Retrieved 2016-12-10. ^ "Anders Berensson proposes wooden skyscraper for Stockholm". Dezeen. 2016-04-25. Retrieved 2016-12-10. ^ "Tratoppen, Stockholm - Designing Buildings Wiki". www.designingbuildings.co.uk. Retrieved 2018-03-22. ^ a b Hunt, Elle (2018-02-16). "Plyscraper city: Tokyo to build 350m tower made of wood". the Guardian. Retrieved 2018-03-22. ^ "The Tallest Timber Tower Yet: Perkins + Will's Concept Proposal for River Beech Tower". ArchDaily. 2016-10-06. Retrieved 2018-03-22. ^ "Building materials: Top of the tree". The Economist. Retrieved 2016-12-10. ^ "Are High-Rise Wood Buildings in Seattle's Future?". Seattle Business Magazine. Retrieved 2016-12-10. Adam, Robert. "How to Build Skyscrapers". City Journal. Retrieved 4 April 2014.